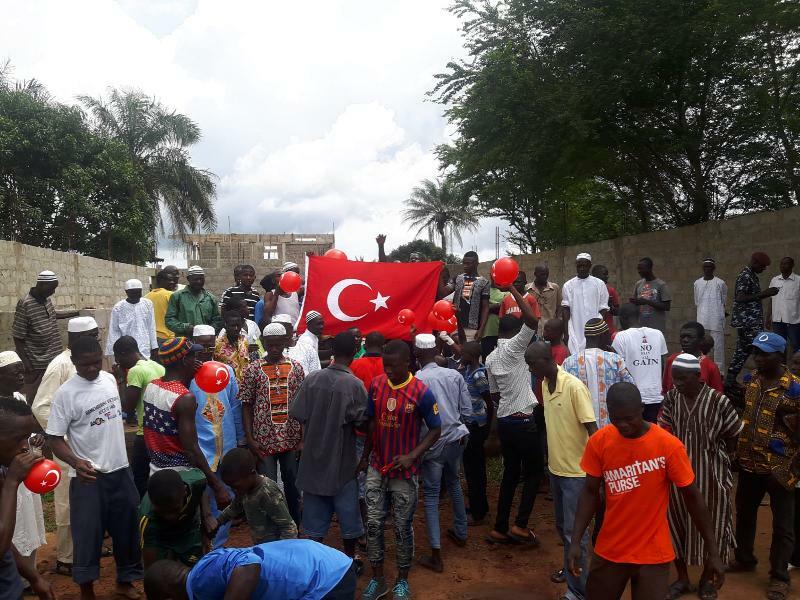 The construction of culture center, mosque and Qur’an course by the support of Turkey and Sierra Leone Friendship and Brotherhood Organization in Sierra Leone’s capital Freetown, is aimed to improve the friendship bridge between the two countries. Üsküdar University President Prof. Nevzat Tarhan contributed to the complex that was initiated a year ago and it is expected to be finished in two years. Prof. Nevzat Tarhan’s name is given to the Quran course that is constructed Medresetüzzehra Foundation as well as the support of Turkey and Sierra Leone Friendship and Brotherhood Organization and initiative of Merzifon Education and Culture Association. Prof. Tarhan’s the late mother’s name, Müzeyyen Tarhan is given to the Mosque. The citizens of the region showed great interest in the ceremony with Turkish flags in their hands. Müzeyyen Tarhan Mosque’s inside has 300 capacity; the garden has 250 capacity, a total of 550 people capacity. 100 students will be educated in Prof. Nevzat Tarhan Quran course. The complex consists of two hectares and has a mosque, Quran course, guesthouse and halls. There will be a two-floor, 400 m2 culture center, consisting of a mosque and a Quran course. The culture center will have another building with a guesthouse and halls. Müzeyyen Tarhan Mosque will be the biggest mosque of the region. The Sierra Leone region with 7 million population has Muslims that compose 65% of the population. The citizens are very glad of this contribution and this will have a great additive to the friendship between the two countries.